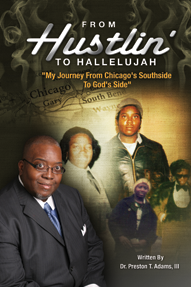 From Hustlin’ To Hallelujah, by Preston T. Adams, III, is an engrossing, real-life story about a black male growing up on the gang-infested, unforgiving streets of Chicago’s Southside in the lively neighborhoods near 68th & Justine, and his journey toward becoming one of the Midwest’s most effective mentors of at-risk youth. The September 2009 beating death of 16-year-old Chicago honors student Derrion Albert, which was caught on videotape and broadcast worldwide by CNN, is reflective of the violent urban atmosphere alluded to in From Hustlin’ To Hallelujah. “That young man reminded me of me,” said Dr. Adams. “He was an honor student, he loved school, and because of the violence and mayhem of his peers, he’s now dead!” Adams said if he could make it out of the raucous inner city, anybody can. This book is compelling, said Cyrus N. “Russ” White, president and publisher for the Christian Board of Publication/Chalice Press/Lucas Park Books. From Hustlin’ To Hallelujah is published by IBJ Book Publishing and is available at amazon.com, prestontadams.com, and Borders Books in downtown Indianapolis. Dr. Adams is executive pastor at historic Light of the World Christian Church, a 143-year old congregation in Indianapolis under the leadership of Dr. T. Garrott Benjamin, Jr., resident bishop and senior pastor. Adams also is chief executive officer of Project Impact-Indianapolis, which targets youth offenders by providing them and their families with counseling, job training, education and dropout prevention, and CEO of PrestonTAdams International, Inc., an executive coaching and consulting firm.